Despite all of the challenges, there are real reasons to be optimistic, starting with the fact those who are in their 60’s today are the same people who survived the tumultuous 60’s in their youth. These are the people who challenged, and were challenged by, the way things were “supposed to work” and they changed the world through their passion, enthusiasm, and collective social conscience. They get to do it again – one last time. These Encores (inspired Americans age 50 and older) offer an unprecedented pool of resources for their communities and the country as a whole. 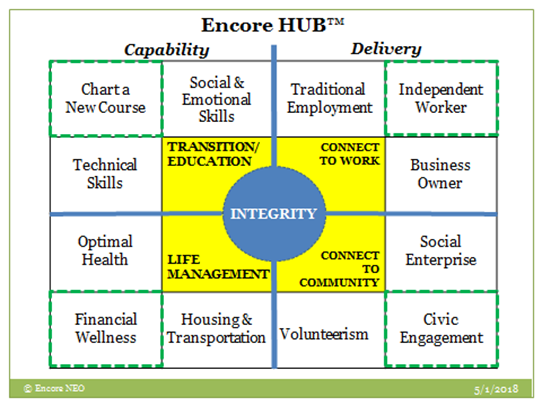 Community and group support outside of the home for motivated Encore Careerists (age 50 and older). Passion, creativity, and innovation in the process of discovering and developing new careers options for Encores. High personal aspirations and tangible progress backed by high levels of personal agency, self-reliance, resilience, and determination. Personal integrity and commitment to high personal standards. Interpersonal collaboration emphasizing mutual support and accountability. Discovery and development of networks that leverage value creation. Identifying and connecting with meaningful opportunities to serve the local community. Balanced perspective, which is serious in intent while maintaining good humor. Targeted learning to support Encore careers. Here are the key program components that have risen to the top through Encore NEO’s four years of prototyping and testing. Isolation is the killer. Economic dislocation after the age of 50 is a trip no one must feel compelled, by self or others, to take on his or her own. There is magic in community support. Others can see a way out for us that may not be visible within our narrow paradigms. And, we gain good feelings from doing the same in return for others. Universally, participants come to Encore NEO in a state of disorientation – perhaps existential in nature. We knew who we were – we had professions and titles. We knew what we did, and why we were important. We were valued by others – both with money and recognition. Now the train has run off the track and we’ve lost our bearings. This is a forced opportunity to “rethink” the entire life trip. We come with so much experience and wisdom. Where do we go from here? This can, in truth, be a very grand adventure. What is important to us – personally? It is a question natural to our age demographic as the end becomes more tangible and we begin to think about our legacy. When you strip away the expectations of others, what is left of ourselves? What do we care most about? What are our core values? What will give us peace and true happiness over our remaining years? There is so much yet to learn. Perhaps decisions regarding personal growth had been delegated to managers and performance reviews over the past decades. Now, we get to discover an entirely new world of experiences, wonder, and growth. How do we focus our all too limited time, energy, and attention to make the most of who we can become for this world? We’ve been confronted with the very real costs of hyper-consumption. Now, what does it truly mean to have financial freedrom – to have a high-quality, flexible, and financially sustainable lifestyle? It may mean moving toward greater simplicity, or not, depending on our aspirations. This one thing we do know – that there is a way to make it work financially. It may be a complex puzzle, but together we can figure it out. Encore NEO focuses on four primary categories and twelve specific areas. Volunteerism: Connecting with opportunities for giving back for the good of society.